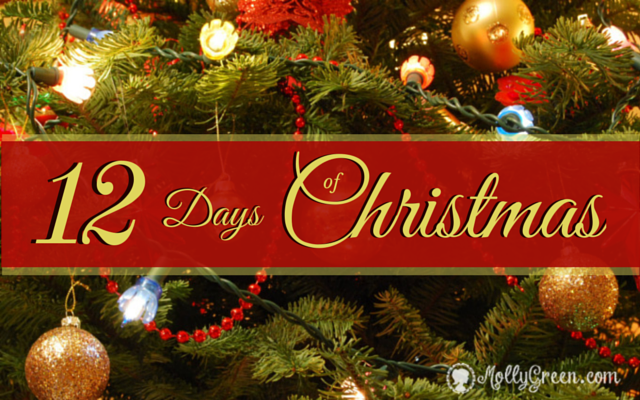 THE 12 DAYS OF CHRISTMAS are 12 days from December 25 till January 5 that are spent celebrating the birth of Jesus Christ, Savior of mankind. The playwright Shakespeare wrote his play "Twelfth Night, or what you will" circa 1601 in honor of these days. The 2 doves symbolize the two natures in Jesus: human and divine or the Old and New Testaments. The 3 hens are the Three Persons in One God, Father, Son and Holy Spirit; but can also refer to the three Theological Virtues: Faith, Hope and Charity. The birds represent the 4 Gospels: Matthew, Mark, Luke and John. They tell of the Good News throughout the world. The 5 rings represent the five books of the Old Testament also known as the Torah or the Pentateuch: 1) Genesis, 2) Exodus, 3) Leviticus, 4) Numbers, and 5) Deuteronomy. These are the 7 Sacraments: Baptism, Confirmation, Holy Communion, Confession, Marriage, Holy Orders, and the Anointing of the Sick. The 10 Commandments: 1) I am the Lord your God; you shall not have strange gods before me; 2) You shall not take the name of the Lord your God in vain; 3) Remember to keep holy the Lord’s day; 4) Honour your father and mother; 5) You shall not kill; 6) You shall not commit adultery; 7) You shall not steal; 8) You shall not bear false witness against your neighbour; 9) You shall not covet your neighbour’s wife; 10) You shall not covet your neighbour’s goods. The 11 Apostles: 1) Peter, 2) Andrew, 3) James the Greater, 4) John, 5) Philip, 6) Bartholomew, 7) Matthew, 8 ) Thomas, 9) James the Less, 10) Simon the Zealot, 11) Jude Thaddaeus. This does not include Judas Iscariot, who betrayed Jesus. These are the 12 main beliefs of the Catholic Church as dictated in the Apostles Creed: 1) I believe in God, the Father Almighty, Creator of heaven and earth; 2) And in Jesus Christ, His only Son, our Lord; 3) Who was conceived by the power of the Holy Spirit, born of the Virgin Mary, 4) Suffered under Pontius Pilate, was crucified, died, and was buried. 5) He descended into hell; on the third day He rose again from the dead; 6) He ascended into heaven, and is seated at the right hand of God, the Father Almighty; 7) From thence He shall come again to judge the living and the dead. 8 ) I believe in the Holy Spirit, 9) the Holy Catholic Church, the Communion of Saints, 10) the forgiveness of sins, 11) the resurrection of the body, 12) and life everlasting.